We're going through a wire-cutting renaissance. In 10 years' time, when wireless charging and earphones rule our tech, we'll probably look back and laugh at how silly and "retro" we all looked walking around with wires dangling from our faces. Helping lead the charge into this wire-free future is Samsung, which has launched its wireless earphones, the Gear IconX. Wireless headphones have, of course, been around for quite some time, but cramming that same tech into earbuds that produce excellent quality audio, power for hours on a single charge, take calls and offer fitness smarts to boot – that's no easy task. Just ask Bragi. And as impressive as the IconX are in many ways, they don't quite hit the point they need to be at. The revolution will have to wait a bit longer. This is a generation-one product, and you can tell, but that's not to say the IconX are bad, only that they suffer from many of the same woes as the similar Bragi Dash. For those of you who have had it with tangled wires but don't want a pair of over-ears, there may still be enough reasons for you to cough up the $199 asking price. We really like how the IconX look. Samsung's done a great job in design considering how much is being crammed into these buds. They're not as svelte as Apple's AirPods, but then Samsung's do more. Each comes with interchangeable wings and eartips, and it's important you have the right ones attached before you do anything; they're snug when they fit, but they won't hold if they're the wrong size. The earbuds come in a small oval container that looks like something you'd put your contact lenses in, except this one charges the IconX when they're inside, emitting two small red lights that signify a charge in process; green when the batteries are full. That means you charge both the case and the earbuds. It also means you can essentially get two cycles out of it if you pop the buds back in the charging case when it's time to juice. The earbuds can also detect when you put in/remove them from your ears, and will power up/down accordingly. These are both ways of alleviating some of the battery woes that plague the IconX, but you're still going to be plugging in that USB cable quite often. More on that later. On the outside of each IconX is a flat touch-sensitive surface, which you'll use to interact with them, and a mic on each for taking calls. Now, there is a range of different touch inputs, and it takes some time to remember which do what. One tap starts your music; two taps skips a track; and holding your finger against either bud for three seconds will begin/finish a workout. It's relatively simple, but you need to be direct and be sure to apply enough force with each tap. What's more annoying is accidentally tapping them when, say, adjusting them in your ears, or brushing your hand along the side. This is more a flaw of human anatomy than the IconX, but still, it can be annoying. The IconX sound quality is more decent than we were expecting, but we wish it were better. Yeah, you might be buying these primarily for fitness, but that means ditching your best-sounding running headphones; which is why it's important that any hearables like these sound good. The audio is certainly clear enough, but it lacks bass. And we like bass. The ambient sound mode is a nice touch that puts your music on gently, letting you still hear things in your surroundings you should be aware of – primarily oncoming traffic. It also means you can have a conversation with someone without switching off your music or taking the IconX out of your ears. What we're less keen on is the set-up process, which is absurdly complicated for something that prides itself on simplicity. You'll first need to download the Gear Manager app onto your Android smartphone – so far, no biggy – and then connect the IconX case to a computer to install an app installed in the case's internal memory, which will then install updates on the IconX. Samsung, this is not how we reach the future. Once you're finally up and running, you'll designate which earbud will be the dominant one for taking calls with. You can also use this moment to install any music you'd like directly onto the earbuds' 4GB of storage, so you can listen without streaming from your phone – just the same as the Bragi Dash. Another thing worth mentioning is compatibility. Samsung says you should be running Android 4.4 or higher on a phone with at least 1.5GB of RAM. Despite what you might have heard, the IconX do work with iOS – but only for listening to music with. And if you're not using a Galaxy device, you'll have to download an additional driver from the Play Store to ensure compatibility. If you're using an older handset (we're talking Nexus 5 era or before), we'd advise checking it will pair smoothly with the IconX before putting down the money. 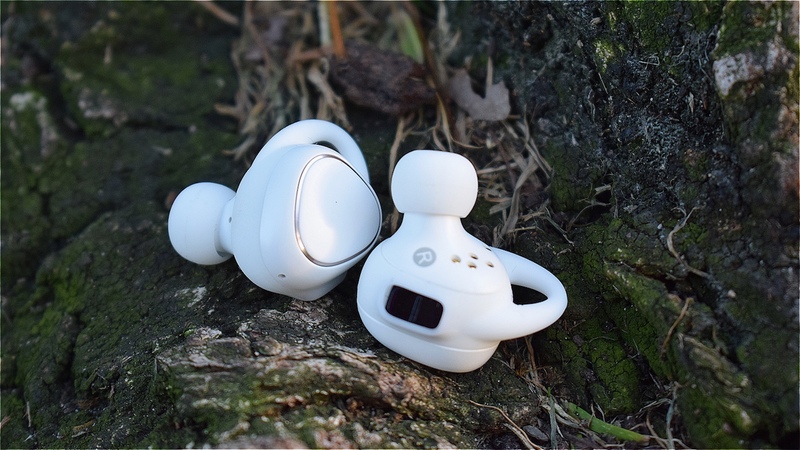 The IconX are being pushed primarily as fitness headphones, and to that end they do a solid job. They can work with or without your phone, but you'll need to sync with S Health in order to get the most out of the IconX. You can also pair them with select third-party apps, like Strava and MapMyFitness, but only to track your heart rate. Alternatively you can connect S Health up with your platform of choice, so the info is transferred when you're done with your workout. Particularly handy is the ability to take the IconX out for a run without your phone and still being able to track distance and heart rate. All you have to do is hold a finger on one of the buds for three seconds, listen for the voice assistant to confirm, and you're off. However, without the phone you won't be able to track your location (no built-in GPS on these) or elevation, so it's worth bearing that in mind when you come to syncing the data back with S Health. You also won't be getting the extra motivation from Samsung's incredibly sarcastic-sounding trainer – just some of the basic prompts in the earbuds. However running without the phone means prolonging the battery life, which is a precious thing on the IconX. We found the heart rate tracking to be decent, but not quite hitting the readings of the chest strap gold standard. We tried it with a Polar H7 strap and got varying results depending on the intensity of the workout. On a gentle jog the heart rate readings between the two were very similar, with an identical peak reading, but on more rigorous runs we found the IconX fluctuated a little more aggressively, tracking higher rises in our HR than the strap – something we've become accustomed to seeing on many optical trackers. While taking their readings from inside the ear instead of the wrist, the IconX are still using optics, and like wrist-worn devices are prone to added "noise" from clattering around during a run, which will always throw the accuracy off a tad. The key, again, is to ensure you've got the right wings and tips attached so it's a snug fit, which will mean better accuracy. So how do they compare to the Bragi Dash in terms of fitness features? Much the same, including the heart rate tracker, but the notable omission in the IconX is waterproofing for swim tracking. They're sweat-proof, but you won't be able to take them for a proper dunking. On the other hand, they're $100 cheaper than Bragi's offering. As we've already hinted at, battery life is where the IconX really fall down. We get that wireless earbud technology is in its infancy, and battery life is sure to get better, but it really stinks at the moment. Samsung estimates 1.5 hours of power for a workout with your phone, and we found that's about the maximum we ever got with these, with them sometimes managing even less when there was a lot of stop-starting. We also found that the "primary" earbud drained faster than its partner. Without the handset, you'll go a greater distance, and while the fact the case can give them another full charge is a nice feature, it's not much use if the batteries go flat halfway through your run. If you're only using them for music, however, you can push the use time up by another hour or so. That's still poor compared to most over-ear cans, but then we wouldn't recommend you buy these for the sole purpose of listening to music with. The IconX are nice little pair of wireless earbuds that offer useful fitness smarts, but they're just a taste of what will surely come. The IconX do a lot of things well, but none of them brilliantly. Still, if you're looking for a wireless solution that lets you keep your phone at home, these are proficient enough. With some improvements here and there – maybe even get the fitness aspect working with iOS – Bragi et al might have something to really worry about.